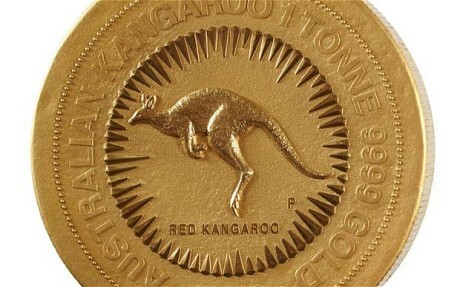 The Perth Mint,Australia has announced the launch of a massive one tonne 99.99 pure Gold coin inspired by Australia’s Kangaroo gold coin series to mark the visit of Queen Elizabeth II.. The Perth Mint produced it in time for the Queen’s visit to the city in Western Australia for the Commonwealth heads of government meeting. The coin has a kangaroo on one side and the Queen’s profile on the other. It is nearly 80cm in diameter and 12cm thick. CHOGM will be opened this week by the Queen, who is in the middle of a 10-day tour of Australia. With a denomination of A$1 million, the coin was “the pinnacle of ingenuity and innovation”, Perth Mint chief executive Ed Harbuz said. “To cast and handicraft a coin of this size and weight was an incredible challenge – one which few other mints would even consider,” he added. The massive coin weighs some 2,231lb and is 99.99 per cent pure gold. It is 31 inches wide and is more than 4.7 inches thick. The weight and purity of each issue from the mint is guaranteed by the West Australian government.